I've been using a Robb MC starter on my 428 and in 5 years and less than 5 thousand miles this is the third Bendix gear that has been ruined. From the looks of the Bendix gear, do you guys out there think that the gear is engaging the flywheel properly? There is no damage to the flywheel. When the engine was originally built I was running a scatter Shield, when the first gear got chewed up I thought it might be an alignment issue so I put an original bell housing back on the engine and it is still chewing the gear up. What could possibly be the problem? The pictures show two of the gears that I have gone through. From the starter picture it looks like you don't have the nose support for the end of the shaft. That's an extra cost option when you buy the starter, but it keeps the shaft from flexing away from the flywheel teeth when the gear engages. That could be the source of the problem; you'll notice that all Ford starters for FEs have that support built in. Robb is a good guy to deal with, I think I would contact him and ask him if he could add that support to your starter. 2X to Jay's reply. I'll add it looks like the starter's teeth aren't engaged deeply enough. On some Fords, especially those with aftermarket bells, tolerance stack-up can cause this condition. With the new parts, I'd use some white lithium grease on the ring gear teeth and spin here over a few time, plugs out for cranking speed. Pull the starter and see how deep or not the starter's teeth engage the ring gear's teeth. One fix is to enlarge the bolt holes to 'swing' the starter closer to the ring gear for deeper engagement. RED, I`m running the same starter. When I first put it in it wouldn't engage the ring gear. I called Rob on a sat afternoon and he explaned the shim process to me and I discovered it needed another few thou. I called him back and he sent me more shims and reinstalled it. It works fine but it will at times free spin. I`m hopping to get the nosecone end sometime soon when the motors out. Good luck. If you purchased the only five years ago, the nose (i.e. the adapter/mounting block with three "ears) should already have the counterbore required to use the pinion support cone (i.e. nose cone). To be certain, remove the four allen head screws and look inside the nose to see if it has a 2-3/8" diameter by 1/16" deep counterbore. If so, you can install the nose cone with no machining to the nose required. Aftermarket scattershields often come with a thicker version of this plate. However, the hole for the starter is often oversize and/or not located accurately. So, use the thin factory plate even if you are also using the thick scattershield plate. I sent the mini starter back to Robb and had the pinion support added, he also load tested the starter , all checked out ok. I re installed the starter, I rotated the flywheel checked the teeth and all are in good shape. I guess I'll take out the starter and put some white paint on the pinion and see where it's hitting the flywheel. Red, sorry about the situation, it gets frustrating. I had a RM starter in 2007 when i built my engine. It worked/sounded o.k. for a few races. Ran the eng for warmup, then on class call, gear had come off, got a new Napa , started o.k., but gear had bent flexplate, hitting block. Expensive weekend ! No nose support at that time, and no rotating locking clamps, i got my money back, as i would not reinstall a starter with no nose support. Don,t use RM without those two updates ! 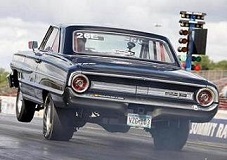 67 Fairlane FE with 2" Hookers. Try a stock starter before you damage something, then go from there with RM. I called Robb again and he suggested measuring the end gap (distance from the end of the pinion gear to the ring gear) the distance should be 1/16th to 3/16 ths. Mine end gap was 2/16 ths so Robb suggested putting in the 1/16" thick shim that is sent along with his starter. There was a shim in starter already so now my end gap is 3/16ths.